Finance Minister Sri Mulyani Indrawati assured that the government would allocate a budget to help victims of an earthquake in Lombok, West Nusa Tenggara. Currently, she added, the effort will focus on how to deal with emergency conditions after the natural disaster. Sri Mulyani said in Jakarta on Monday that the amount of funds depended on the need to save as many lives as possible, which was currently being implemented by the National Disaster Management Agency (BNPB). 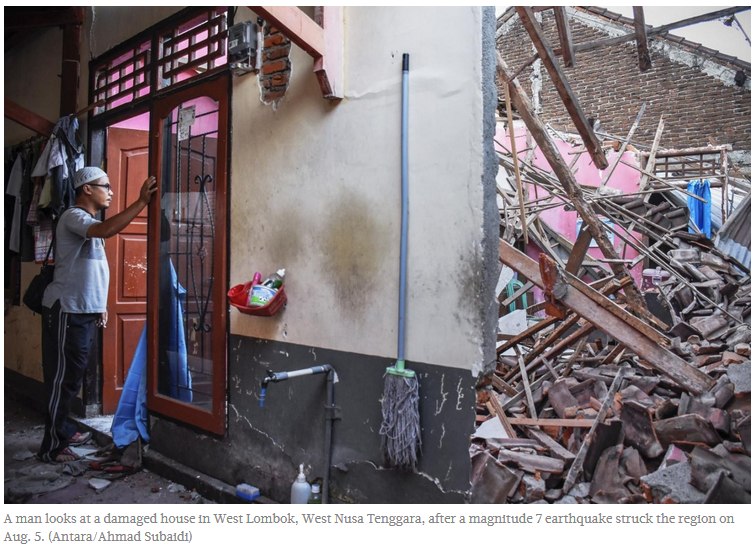 “The BNPB is ready to implement and we fully support [them] from the budget side so that they can implement the operation quickly,” she said as reported by kontan.co.id, adding that the government would also identify damages to the locals' buildings. Sri Mulyani said the conditions of the buildings would be grouped into three categories – heavy, medium and minor damages. He said the government already had experience in providing assistance to earthquake victims in Yogyakarta and Padang, particularly on how they will rebuild their houses. “It relates to the assistance given to the victims to rebuild their houses,” Sri Mulyani added. She could not mention the fund prepared by the government to renovate residents’ houses, saying it depended on the result of the identification of the damage caused by the disaster. “We are ready to [offer] support. About the amount of the government’s assistance, it depends on the condition of the houses,” the minister added.